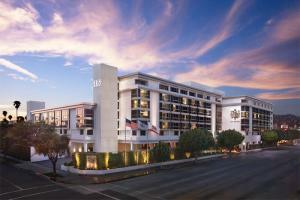 This luxurious Beverly Hills hotel is set in the heart of Los Angeles on Restaurant Row. This convenient locations is just a few blocks from sparkling storefronts of Rodeo Drive and The Grove. Guests can enjoy unforgettable dining experiences and extraordinary cuisine at the restaurants and lounges. Each of the 297 guest rooms and suites is ultra-modern and classically elegant. Situated in the heart of Los Angeles on Restaurant Row.